Friday, May 4, 2012 was one of the district’s unused snow days for the school year and classes were dismissed. My former piano teacher, Myra Schubert, had invited me to Bethany to see her current flock of pupils at her 60th teaching anniversary recital that evening. So I looked for a day hike I could make en route and opted to try the other lake near Stillwater, Lake Carl Blackwell, having hiked at Lake McMurtry a year earlier. Carl Blackwell is a larger lake only a mile southwest of McMurtry and features over 50 miles of equestrian trails, all nicely mapped on the OSU website since the university owns the lake. My Oklahoma Hiking Trails book warned me that the area has many ticks and chiggers, so I stopped at K-Mart as I left town to stock up on Deep Woods Cutter. The forecast said I’d be hiking in the low to upper 80s, so I dressed for the heat and insects by donning a light wicking T-shirt and my RailRiders Eco-Mesh pants, which have side mesh panels down the length of each leg which I can zip open for airflow. A later extensive internet search revealed that the lake is named for the late Carl Petty Blackwell, who graduated from Oklahoma Agricultural and Mechanical College (present-day OSU) in 1918. After serving as an agronomist for the National Fertilizer Company he became the dean of agriculture and director of the experiment station. He passed away as the lake was being constructed in the late 1930s. The lake offers a number of amenities and I was happy to pay $5 for a day use permit after exiting the Cimmaron turnpike and driving a few miles west of Stillwater to the lake. I drove across one arm of the lake and down past a water tower to circle the lake store and get a sense of the surroundings, espying a fisherman along the shore before driving back to the then-empty Hunt’s Meadow equestrian camp to park. I walked west past a row of pine trees to a large trail map, which indicated the orange loop I’d be taking was for beginner riders. It showed a nearby blue trail was for the advanced rider looking for fun. I crossed Highway 51C to the trailhead, which was coated with the first of the button markers and ribbons which clearly delineate each of the trails. The trail led across a meadow and across a creekbed lined with trees, a pattern which would continue for a few miles and provide me with ample opportunity to observe many butterflies darting among the flowers. I saw a lot of cow parsnip and a low clustering growth along with the occasional purple flower, flax, fleabane, and evening primrose. Some bunched up to pose together and some grouped with others of their kind. I passed one plant which at first glance looked like cow parsnip, but on closer inspection was something else. I followed the orange markers through scrub forest and through treerows and one of the many butterflies finally paused to pose. The trail finally pushed out along one isthmus of the lake, where I took a side trail down to the shore. The Three Men in a Boat were there, evidently having finished their tour along the Thames, with a ledge-like platform sticking out of the lake near me. I passed something resembling an immense dandelion head, which the internet tells me is one stage of meadow salsify. The trail skirted the shoreline and I passed blackberry blooms and one large toadstool, capturing a nice close-up of a purple poppy mallow. The horse trail had its expected areas of churned mud, although on one slope the horses had cut through to rock. A herd of cows across the lake streamed down into the water to cool off as I passed some very pretty sensitive briar. Beside me were the Three Men in a Boat, while an AWACS plane thundered by overhead. I was growing tired of the shoreline and was relieved when the trail ducked into the trees for an intersection with the blue trail offering crude dining benches. I followed the blue trail up to Rattlesnake Ridge, where a box turtle bumped my boot. The ridge provided the only big rocks and high views along this hike. I was in the cross timbers, with some rather ugly trees. The grades on this trail were indeed far more challenging than the orange trail. The blue and orange trails again intersected and trees were festooned with ribbons when they parted ways again. 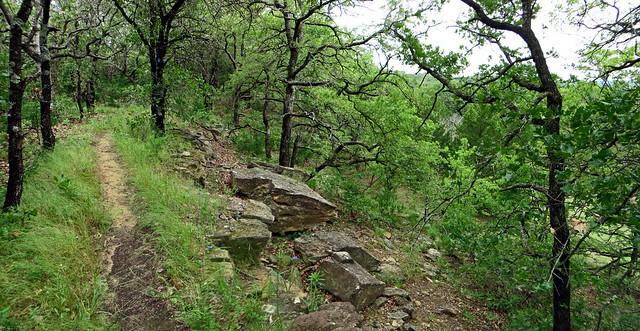 I returned to following the orange trail, taking what a sign indicated as the Price Loop back toward the trailhead. I passed an intimidating dead plant barrier and then the trail sidled along a barbed wire fence for a long ways. The remainder of the trail was noticeably straighter than the meandering part along the shoreline. A gap in the growth of the fencing gave a glimpse of some silly silhouettes in need of weedwacking and dragonflies darted along the trail ahead of me for awhile. A nearby homeowner had a collection of tilted birdhouses. I passed a silverleaf nightshade and a sign told me I had two more miles to go, following in the tracks of one of nature’s bandits. 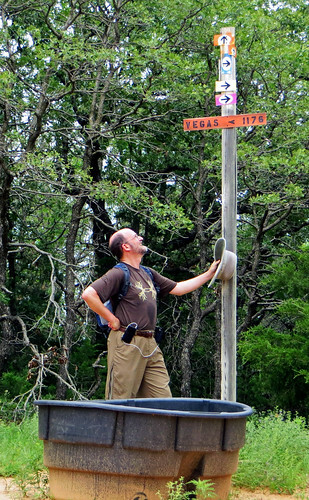 I reached some water troughs where a sign told me it was only 1176 miles to Vegas. Turkey vultures circled as my trail joined several others in the Big Dip through a creekbed. The trail through the trees had grown somewhat monotonous when I was rewarded by it breaking out into a wildflower meadow with a last look at the lake. I returned to the horse camp, where a couple of trailers and horses had come in. A friendly ranger asked about my hike, which had extended 7.9 miles, and said about 100 horses would be in by the next day for the 6th annual Poker Ride, where riders collect cards along the trail to see who winds up with winning hands. I’m sure glad I hiked the horse trails the day before that ride! This was my second outing with my Canon Powershot SX260 HS and I was again happy with the image quality although I still have to trick it out of overexposures. The GPS continues to be balky. So long as I was careful to hold the camera with the sensor up to the sky for long enough, it would get a lock and record the coordinates, but I had to check the display each time to be sure. Many photos I failed to check still lacked coordinates, which then had to be hand-placed when uploading to Flickr. I’ve ordered a new belt case that holds the camera with the top pointing skyward, which may help. My old Panasonic cameras would just record the previous GPS lock if they didn’t have a fix at the time of a shot, which sometimes led to inaccuracy, but I preferred that to not posting any coordinates at all. The hike was a welcome break after a stressful work week, and allowed me to break the 100 mile mark for the calendar year.